Coffee addicts will soon take further pleasure from their morning brew, with the knowledge that the grounds from their drink are contributing to more environment-friendly roads, thanks to researchers at Swinburne University of Technology. 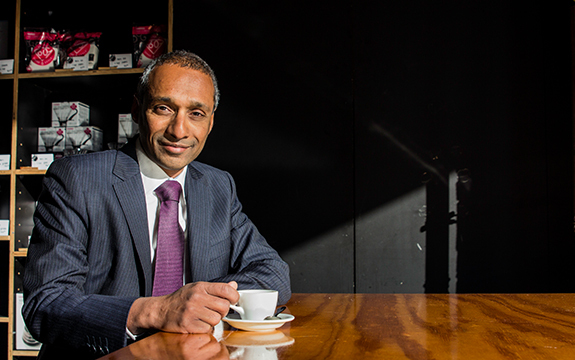 Professor Arul Arulrajah from the Swinburne Centre for Sustainable Infrastructure and his colleagues found a way to treat the unlikely combination of coffee grounds and slag from iron production for use in roads. “I am an avid coffee drinker and I noticed that baristas throw away a lot of coffee grounds,” he said. the mixture won’t become the dominant road-base anytime soon. being approved for road-building. Australia generates around 19 million tonnes of waste from demolition and construction each year, including potentially reusable concrete, rock, brick and glass. Only 55 per cent is re- covered or recycled. base and were limited to small percentages, but Arulrajah and his team tested waste concrete, rock, brick, and glass and found the materials as good or better than quarried material. “We used the same rigorous tests as with quarry material, in the laboratory and the field,” said Arulrajah. Vic roads has now approved adding 15 per cent recycled glass or brick in high-traffic roads and 100 percent recycled in low-volume roads. The use of landfill waste over virgin quarry materials lowers the carbon dioxide emissions associated with road-building. Sourcing the raw materials and turning them into concrete, plus the chemical reaction that occurs as concrete sets, releases 65 per cent more carbon dioxide than repurposing waste concrete for road-base. Another research project is looking to improve the lifespan of footpaths by adding rubber from old tyres, through funding from Tyre Stewardship Australia and Vic Roads. “Australia produces about 52 million passenger tyres annually,” said Liam O’Keefe, Market Development Manager, Tyre Stewardship Australia. “While we send some tyre waste overseas to be burned as fuel, we only recycle 5 to 10 percent in Australia,” O’Keefe said. Professor Arulrajah is researching how to add tyre-derived aggregates to the sub-base layer to reduce cracking and lengthen pavement life. Published in Research Impact Magazine, published by Nature Research for Swindburne University, 3 March 2017.